The 2018 Commonwealth Bank Not-for-Profit Treasurers’ Awards are now open! Designed to recognise the contribution that not-for-profit treasurers make to their community group, NFP sector as a whole and to Australian Society! 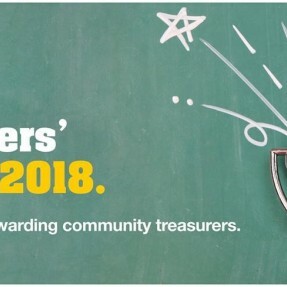 The 2018 Commonwealth Bank Not-for-Profit Treasurers’ Awards are now open! As a past participant of the Awards, we're writing to let you know that this year's awards are now open! The Awards are designed to recognise the contribution that not-for-profit treasurers make to their community group, the not-for-profit sector as a whole and to Australian society. We would, once again, love your help to celebrate our community treasurers. This year, it’s easier than ever to take part. With four $5,000 donations to be won, judges will be looking for the best examples of sound financial management, sound financial governance and/or successful financial outcomes. To nominate or enter, tell us, in 100 words or less, why you or your treasurer deserves to be one of our 2018 winners. If you’re a community or not-for-profit treasurer, then let us know why you think you should be one of our 2018 winners. CLICK HERE TO NOMINATE OR ENTER NOW! Every nominated treasurer will also be awarded with a 2018 Not-for-Profit Treasurers’ Awards Certificate of Appreciation. The Awards close 11:00am AEST, Friday 27 July, 2018.